If we look back through time, every person we revere had wisdom, and the more wisdom they had, the more lasting has been their place in history. Each had learned the Art of Living and shared their hard-earned wisdom with us in their unique way. It would seem then, if we desire to master the Art of Living, we must also figure out just what are the “eternal truths,” and apply them in our own lives. We have been taught the search for those truths is incredibly difficult and reserved for philosophers and priests. We common folks can only hope to dabble around the edges and gain a few crumbs, but great wisdom will escape almost all of us. Thankfully, this is not an inescapable conclusion. On the contrary, the “eternal truths” have been staring us in the face since man first became man, but we have been too blind and too busy to see them for what they truly are. The eternal truths are the principles by which the brightest and best of us lived, and live. How principles actually work appears to have been the real secret all along. Principles are classified in the dictionary as nouns, but in the Art of Living Dictionary, principles are adverbs. How knowledge is used is as important as the knowledge itself. Principles guide us to the highest possible use of knowledge, regardless of the era in which they are to be used. Wisdom has also been defined as “the discretionary use of knowledge for the greatest good.” In this definition, our personal responsibility in the process is clearly stated in the term discretionary. What we choose to think determines our choice of actions. The principled use of knowledge yields the wise course of action. So the eternal truths are always available to each of us and we need struggle no longer searching for them. In our hearts we already know the right “thing to do.” We simply need to practice until thinking that way becomes a habit. Here is a partial list of the Eternal Truths. At this time of year we celebrate many Messages of Eternal Wisdom. The instructions to Love one another are indeed possible if we let The Messenger’s List of Eternal Truths guide our thoughts. Just as millions of other readers, I was captivated by Dan Brown’s The Lost Symbol. The power of the human mind is indeed amazing and has not yet even begun to be developed in any serious way. Being a serious student of the mind, the book was especially interesting to me for a variety of reasons. The first two books in Brown’s trilogy basically exposed religion for what it always has been. Will and Ariel Durant concluded in their "Story of Civilization" that religion did not evolve as a way for man to find God. It evolved as a way "to coerce moderate pro-survival behavior in a tribe." That makes a lot of sense to me. Next to the guy who had the biggest club, the most powerful person in a tribe was the one who rolled the bones. The sad part is that the current system has also been subject to the foibles and failings that inevitably infect all power structures. The Lost Symbol offers an alternative path; that of self realization as taught by ALL the true Masters who have ever walked the planet. The Masons and other “Secret Societies” have worked diligently to maintain the ancient wisdom, often at the cost of their own lives. Why do you imagine the documents from Nag Hammadi were hidden? Granting that the ancient wisdom is everything it is imagined to be, the challenge still remains to be able to use it, whatever “it” is, in our individual lives. Someone once stated that even “the truth must be arrayed in the garb of the day.” In more modern words, we must translate the ancient knowledge into something we can relate to, understand, and use, today. Looking to the past to give us the answers won't work because we are looking for what "can be," not what was. From the past we can gather some important guidance about where and how to look, but the work must be done today. Imagining the reality is much simpler today because we have access to numerous great metaphors not available before. Implementing the reality may, however, be more difficult today than ever before because of the numerous distractions and pressures we allow to be part of our modern world. To boil the message of the ancients down into the sound bite sized information we have been conditioned to receive, the message is this: The “Mind,” the animating part of our being, exists outside of our physical brain. It can be referred to as Soul, Spirit, Atman, Christ Consciousness, Buddha Mind, Quantum Mind, or any other name we can think of meaning something so big we cannot possibly comprehend it and also that it knows a whole lot more than we do. Actually the Mind doesn’t “know” anything in the same sense as we do. The Mind is the storage of every action and reaction that has taken place in the Universe since the Big Bang. It contains all the archetypes and the residues of everything that has happened in the last 14 billion years. We are expressions of The Mind and there is only One Mind. The teaching of The Masters that we are all One is probably the most difficult for any of us to grasp. Thankfully we have radar to use as a metaphor. Radar works by sending out billions of rays. If a ray bumps into something, the ray has an individual experience and is reflected back to the Source where a Big Picture is compiled using all the beams that have been reflected. Each beam has an individual experience and if it were as semi-sentient as we are, it may even conclude it has an individual existence just because it had an individual experience. The real Source, Experience, and Potential manifested by the beam, however, is as a part of the Whole. So it is with us. We conclude we are having an individual existence because we imagine we are having an individual experience. This faulty conclusion is the result of asking our brain what something means rather than asking our Mind. Our brain is limited to recording experiences and then comparing current experiences to past experiences and assigning meaning to them. A good example of this is to imagine standing at a bus stop with your Lover, who leans over and pats you gently on the backside. The physical sensation you feel is exactly the same as if you were standing there alone and a total stranger patted you on the backside, but the meaning and emotion your brain applies then will be radically different. Two diagrams may help. The first demonstrates our Human habit of being taught to ask our brain what something means instead of our Mind. We are taught to do this exclusively. We, especially in the West, are taught to ignore things like intuitions, premonitions, and gut feelings. We also make a huge mistake when we define Love as warm fuzzy positive emotions we have about someone or some thing. What can Mind experience directly. Not much because Mind functions in the Present and all meaning our human brains apply our current experiences are reflections of our past experiences. Mind can directly experience almost nothing in our physical experience other than Love and those things we have been taught to ignore. 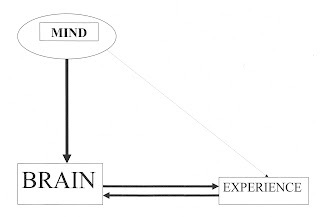 The flow of energy from Mind to Matter more or less follows the path in the following diagram. At any step in this process we can interfere with the energy and mis-qualify it with our beliefs and emotions. The “Secret” proclaimed all we need to do is “intend” and the giant catalog in the Universe will deliver whatever we order. At least 95% of us cannot make intention work because intention is wishing, and our beliefs, or expectations, are much more powerful. We also have lots of “issues” when considering our Identification, Capacity, and Ability, to make something happen just because we desire it. Notice the absence of any of the words such as Soul, Spirit, Atman, Christ Consciousness, Buddha Mind, or Quantum Mind in any of these explanations. The use of these words describes something we “may” be on a different plane of existence. Those words also create and maintain an artificial separation between who we actually are and who we have been taught to think we are. That separation simply does not exist, but because we believe it to be so, it is for us. WE ARE MIND. The world we inhabit is subject to the same laws that apply to the rest of the Universe. The physical manifestations in our imagined individual experience came about by our use of the same process Mind uses. By depending on our brain for definitions however, we make mistakes in the areas of identification, capacity, and ability, and mis-qualify and mis-create manifestations, BUT the process we are using is the same. To experience Mind, close your eyes and hold up your hand. What does your hand feel. Other than knowing you have a hand, the hand is feeling nothing. At one time, you are experiencing Mind and living in the Present. Your brain is on hold, waiting to feel something it can experience. It is this Potential to experience that is at the Heart of Mind. If you go ahead and touch something with your hand, your brain comes on line and tells you what you are experiencing, but it is really only able to tell you what you have already experienced. What would our world look like if we didn't already know what we were seeing? "We are not our thoughts, or the object of our thoughts. We are the Thinker." IF OUR GOVERNMENT WERE REALLY SERIOUS ABOUT HEALTH CARE REFORM, WOULDN’T THE REFORM ADDRESS SOME OF THE FOLLOWING? 15. High Fructose Corn Syrup contents. Since the dawn of man, motivation has been used to urge people to learn something. For the majority of our existence on this planet, Mother Nature was been all the motivation any of our ancestors ever needed. It was really simple, “Learn, or die.” So we learned and kept on learning until now, when many of us have the luxury of never having been hungry or without shelter. As a species, we have succeeded in becoming so materially prosperous that our physical wealth has given rise to even greater problems. We have learned that full stomachs, comfortable beds, and an infinite varieties of toys and distractions just don’t bring us the peace, contentment, and security we are actually seeking. They elude us and the evidence is all around us. Fifteen of the top selling twenty drugs in the USA in 2006 were for depression, anxiety, or pain. This is a massive problem. If the trends continue, eventually the majority of the population will be depending on drugs for a sense of well being rather than being able to rely on their own personal knowledge and capabilities. The statistics show we may have already reached that point: 70 million Americans have hypertension, 46 million suffer from depression, 43 million from anxiety, 20 million can’t sleep, 16 million have road rage, and almost 3 million are incarcerated in prisons and jails. Depression is the second highest cause of illness and death in the age group 15-44 years and the World Health Organization predicts, by 2020, it will be the second leading cause of illness and death worldwide in all age groups. We are in a huge transition, evolving from being an industrial society to being an informational society and the current economic turmoil is part of the change. What it will look like when we get there is not known at this time, but most of us realize we must acquire some new skills if we are to survive the shift in good shape. We are now even more motivated because we realize that material wealth is a disappointingly small part of the overall path to real abundance. We must look elsewhere for the answers. Motivation is still the method most used to inspire us to change, but motivation is only a skill used by the ones doing the motivating. Motivation is not a skill for change; it is the reason for change. It appears we all want self-directed, peaceful, happy and prosperous lives, and a huge amount of effort is going toward attempting to achieve those goals. Many of us have progressed enough to understand the changes we must make are actually internal; that they must be made by each of us on an individual basis. But what are the skills we must learn and the changes we must make? What we need right now is a manual that will help us understand and develop the skills to live in an informational age. Actually they are the very same mental skills that have been used by all successful people since man became man and they are listed below. The most important skill is introspection. We need to learn to see our thoughts and experiences as information. Then we can see that it is “how” we use that information that is most important. The Industrial Age education tried to teach us everything we ever needed to know to be good employees as long as things didn’t change, but guess what? Things changed and are they changing rapidly and we are having difficulty changing with them. We are deluged by an enormous amount of information we have to process, a huge number of options to select from, and more decisions we simply have to make that ever before. AND, if that isn’t enough, the information is changing rapidly. The life of a new idea used to be years. Now, by the time a product is available on the market, it is obsolete. How are we supposed to survive, let alone thrive, in such an environment? It’s not magic. We need to learn how to use what we know in different and more efficient ways so we can adapt as the changes happen. Mental flexibility is the key. Our mindset has to change to accept change as a way of life. If we don’t know how to use a tool, even the most expensive tool in the world becomes nothing more than a paperweight. Once we learn and practice the processes of change, we will be able to respond to change rather than simply continue on as we always have. Like learning to drive a car, we get better with practice. Eventually we will become proficient and change will cease to be threatening as it is for most. Also, after we have learned and practiced the processes involved in change, we will understand the tools and techniques that underlie the success of all self help and motivational systems. We will be able to understand that there really is no secret within the “Secret.” We will also see the reasons many people get a temporary boost from motivational systems and then slowly slide back into their original behaviors. Personal change is not really difficult, just really misunderstood. The very fact that you are reading this email demonstrates you already have the foundation for what it takes to have a peaceful, happy and prosperous life. It's my job to convince you of that, and help you recognize and enhance the thinking tools and techniques you already use to help you attain it. What I didn't realize is that I already had the tools and techniques to remake my life. I had the answers. WE ALL have them. We really do! Every time we succeed at anything it is because we used some very specific thinking skills. Thinking is basically a collection of habits. We all have thinking habits that can lead us to success and we have habits that sabotage our hopes and dreams. We can learn to enhance the ones that work and eliminate the ones that don’t. But wanting to know how to do something and knowing how to do it are not the same. “I am rich and happy and you can be too,” does not teach us how to be either rich or happy, does it? Up until now, motivation has been the basis for most self help systems, but 94% of us can’t make the systems work, not because we don’t try hard enough, but because MOTIVATION IS NOT A SKILL SET! YOU DO TOO, in the successful parts of your life. 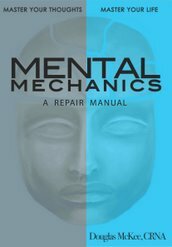 MENTAL MECHANICS: A Repair Manual is the first easy to understand and usable manual describing the thinking processes we use when we are handling emotions, needs, wants, self esteem, and relationships. These are the areas of our lives that generate us 99% of our stress and negative emotions. MENTAL MECHANICS is the missing companion to the positive thinking books. It is the book that can teach us how to quit thinking negatively so the positive can work. The simple tools provided in the manual enhance both our understanding and ability to choose successful thought processes and break the habit of using the negative ones that generate 99% of our negative emotions. It’s not rocket science, you are already using them! You had to, to get this far. What can you get by understanding how you think and learning to focus your energy on solutions rather than problems? MORE SUCCESS, FEWER NEGATIVE EMOTIONS, BETTER HEALTH, and BETTER RELATIONSHIPS AT HOME AND AT WORK. Of all the areas that are difficult to truly grasp, understanding our own thinking process has to be at the top of the list. We have been taught that the entire subject is shrouded in biochemistry, unfathomable genetic process, emotional injuries sustained in childhood, and quantum physics that defy logic. Even the experts can not come to any kind of usable consensus. No wonder so many problems arise from processes we all must use every minute of our waking day. Thankfully, my parents, teachers, and friends did not realize learning how to do something was so impossibly difficult. My mother taught me how to swim at age three; my father taught me how to ride a bike, and so on. They managed to teach me an incredible amount by age eight. After that if I wanted to understand how to do something, my first step was to ask someone who knew how to do it teach me how to do it. We can fast forward to an adult me in my late thirties wondering why life was so difficult. Why are relationships so likely to fail and why raising children is at one time, the most rewarding thing we can do and the most frustrating exercise in futility? Instead of giving up I decided to learn to meditate because I was told that meditation was the path to personal peace and tranquility. It is that, but the world I left behind when I went into my bedroom to meditate was still lurking outside the door to cause me the same old problems after my meditation was finished. Trying to understand what to do and how to do it to make my life different, somehow led me to an incredible conclusion. If I wanted to learn how to be a happy, peaceful, and productive adult, I should ask the adults who are, if I could find them. That conclusion started a process that goes on still but many, if not most, of the questions I had then have been answered, only to give rise to others more intriguing and marvelous, but the process of asking, learning, and practicing has become a way of life and continues to yield amazing results. Since I wanted to become successful in many different areas of my life it seemed to be reasonable to study how successful people do the things they do. Little did I know there was so much information available. Asking “how” instead of “why” was a very different direction than that being used by most “experts,” but it was the most important decision I would ever make. I almost always know the why I want to do something but Motivation is NOT a Skill Set. What is missing is the how, the skills necessary, to do those things successfully. We don't need to know how the engine in our car works to drive a car. We don't need to know how a computer works to surf the internet. And we certainly don't need to understand the biochemistry of our brain to be able to take control of the thought processes going on in it. Thinkers, philosophers, visionaries, saints, and all successful people all have something very important in common. We are all included in these categories because we share those same very important things and you will soon see that you really do. I don't have to prove a thing. You can do that for yourself. The proof is all around us and in many of the things we already do every day. I accidentally discovered the key to a happy, peaceful, and prosperous life in the eighth grade so it is actually quite easy to understand. I just didn't realize what it was or how to apply it to the other areas in my life that caused me problems for the next 40 years. I still often feel like the guy in the V-8 commercial. For a bit I am going to ask you to consider everything you know as simply data, including emotions, beliefs, and preferences. Our brain is marvelous. The more we study it the more miraculous the whole thing becomes. It is storing a huge amount of data every second we are awake. The smart part compares incoming data from our senses to what we have already experienced so it can apply meaning to it. This allows us to use the data to relate to what is going on around us. We do not experience many things directly. This is a really simple explanation of what is going on but it is sufficient to show us what we need to know. All our brains work the same way. When we all went to school, we were only taught the rules and tools for handling two kinds of information; arithmetic and grammar. Neither of those two types of information are responsible for the emotional disorders that are exploding in our cultures today. The types of information that cause most of our problems today are emotions, needs, wants, self-esteem, relationships and work and they do so because we were not taught the rules and tools that would allow us to handle them correctly. Think back to how we were taught arithmetic and grammar. We went over and over and over the same material until it became an automatic response that we didn't have to think about. Spelling, multiplication tables, colors, shapes, and all the items that we encounter every day were pounded into our brains until a recently described process named Long Term Potentiation, or LTP, turned that repetitive thinking into a simple habit that no longer required any thinking. Learning to drive is another good another example. The amount of concentration and attention that went into learning how to drive was incredible because the possibility of danger was so high. How much attention do any of us need to pay to our driving now? Almost none and it is because the same LTP turned the learning experience into a habit. LTP is an incredible process. Most animals exhibit it and to be sure it is a really limiting factor in their behavior as well as it is in ours. Fleas for instance can be trained not to jump out of a jar by keeping a lid on the jar. After jumping up and banging their heads on the lid so many times, the fleas simply quit jumping that high so the lid can be removed and the fleas don't jump out any more. So when you hear someone referring to another person as being "flea brained," it means the other person is obviously using very little of the intelligent part of their brain at the time. And this can actually be said for each of us most of the time.